Campbell Rowley came to LoveLove Films with a animation brief from Creative and Cultural Skills who are the leading voice for youth employment within Britain’s creative and cultural industries. As an independent charity, Creative & Cultural Skills helps young people make the leap from aspiration to employment, supporting them as they strive for careers in the country’s fastest-growing sector. They lead the National Skills Academy network of employers and educators to provide the next generation of creative talent with the skills they need to succeed. LoveLove Were commissioned to produce a ‘DigiMan’ animation from the agencies original design that could be projected throughout the UK onto key buildings in order to accompany their campaign. The digital man involved 3D modelling of individual objects and then creating a physics simulation in Cinema 4D in order to make these element rotate and fly around to form the Digi man and key messages of the campaign. The animation was projected onto multiple buildings throughout the UK, and helped to draw attention to the ‘Building a Creative Nation Campaign’. 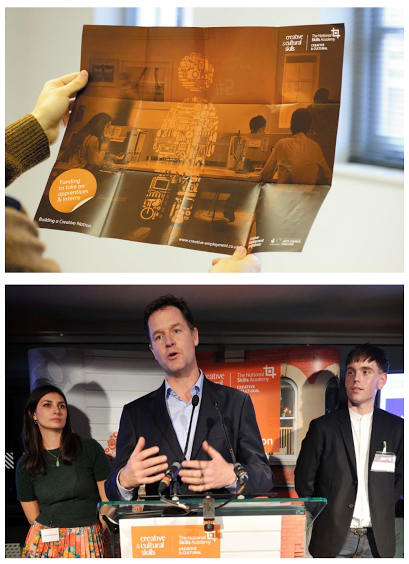 The animated character LoveLove created is featured on the Creative and Cultural Skills Campaign website, and was used at events that the former Deputy Prime minister Nick Clegg spoke at.